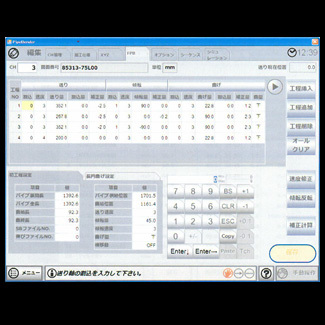 Tube bending simulation software - Products｜BECS MASTER Chiyoda Kogyo Co., Ltd. The simulation software can omit a process of trial bending, also practically usable for piping design sectors. Efficient processing become possible since the software can calculate and show cycle time, interference check with machine body, 3D bending process and developed length of tube without requiring actual trial bendings. The software can create optical simulation of bending processes in 3D display. Switching among three different bending tools (single-stack bending, double-stack bending and triple-stack bending) is available just by entering the respective data. 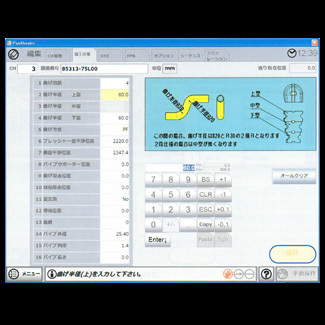 You can select the setting of show/hide for dies such as bending, clamp, pressure, chuck and wiper. 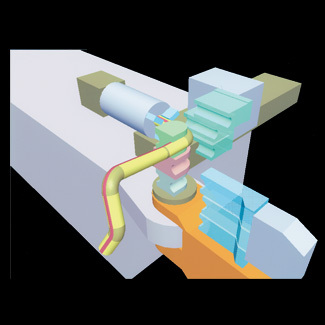 The size of each die can be changed just by entering dimensions for more realistic simulations. During the simulation, various functions, including temporary stop, zoom-in/out, angle change (180° right/left/up/ down), stepwise motion and motion speed change, are available, allowing more precise interference check. It calculates and shows expected bending cycle time based on the data entered.